As part of International Week of the Deaf, Leicestershire Police became the first police force in the UK to sign the British Deaf Association’s Charter for British Sign Language (BSL). 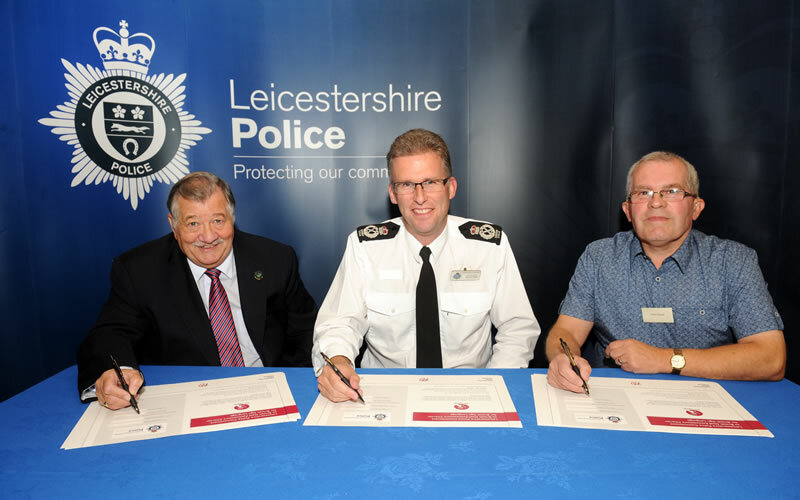 Yesterday (Wednesday 24 September), Leicestershire Police invited members of the Deaf community, along with the Chair of the British Deaf Association, to witness the Force become the first police service to sign the charter. The Charter aims to eliminate unlawful discrimination, advance equality of opportunity and further good relations with the Deaf communities within Leicester, Leicestershire and Rutland. The Force has developed its relationship with the Deaf communities across the city and county through its PLOD (Police Link Officers for the Deaf) scheme. The Force has 18 officers and staff who range from Level 1 (elementary) to Level 3 (advanced) and support the Deaf community by acting as a point of contact in a variety of incidents or for community issues. The Police and Crime Commissioner, Sir Clive Loader, visited the Leicester Deaf Action Group with PLOD on Monday 22 September. Some members of the Deaf community meet at the Monday ‘Open House’ session to chat and get the opportunity to speak informally, or formally, with a police officer who is BSL trained. Sir Clive Loader said: “It is extremely important that we maintain a good relationship with the Deaf community. Providing a support for them through PLOD ensures that they aren’t excluded. In light of recent events in the city (the murder of Christopher Penman) it is vital that this community is given the chance to have their say and feel that they are supported. Dr Terry Riley OBE, Chair of the British Deaf Association, said: “I commend Leicestershire Police for being committed to ensuring the legal rights for all Deaf and hard of hearing people, especially at every stage of the caution and arrest process. Article extracted from: Leicestershire Police website – issued on 25/9/14 at 9:30 a.m.